With equities closing moderately mixed, the VIX remained in melt mode, settling -4.2% @ 12.20 (intra low 11.93). Near term outlook offers renewed equity weakness into end month, which might equate to VIX 16/17s.. briefly. 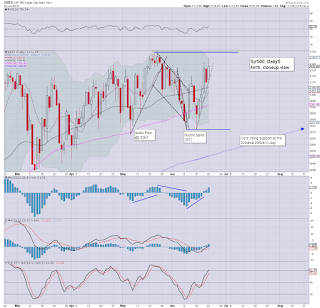 The big 20 threshold looks out of range for at least another month or two. With equity indexes battling upward, the VIX was naturally still cooling. Even if there is renewed market concern about Greece into end month, the sp'2060s would likely only equate to VIX 16/17s. 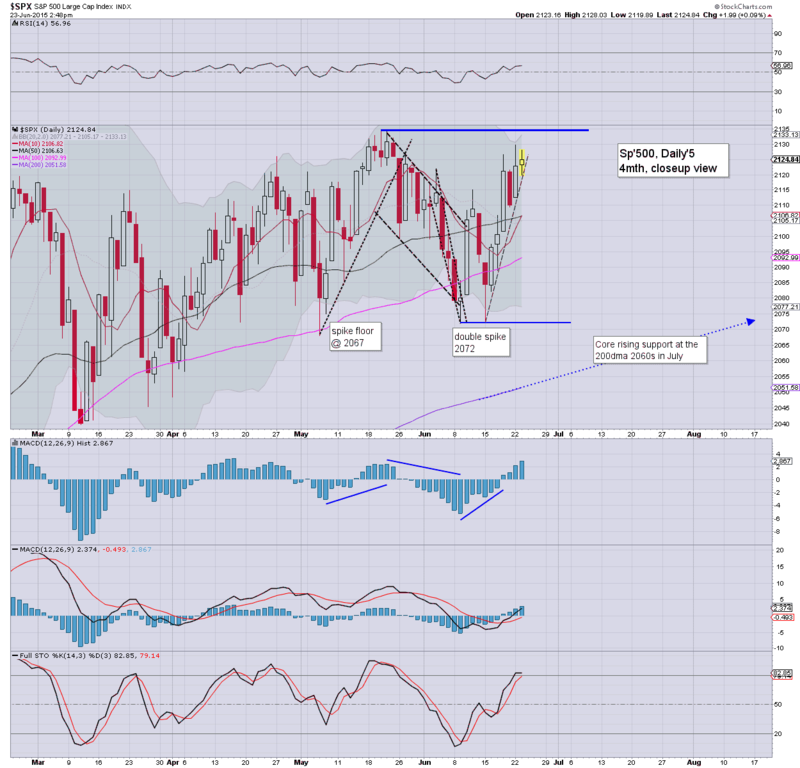 The big 20 threshold looks out of range in the near term. US equities closed moderately mixed, sp +1pt @ 2124 (intra low 2119). The two leaders - Trans/R2K, settled -0.1% and +0.3% respectively. Price action remains increasingly tight, and near term outlook is for renewed weakness into end month. Best downside case remains the sp'2060s. *closing hour.. very minor chop... as expected. A pretty quiet... but somewhat fine day in market land. The big ascending wedge continues to tighten... a break lower looks due, although in theory.. that might not be until Friday/next Monday. *... that was the last scene ever filmed by Lancaster in a major motion picture. US equities are set for continued minor chop into the close, with the sp'500 set for the 5th net daily gain of 7, since the sp'2072 low. VIX remains very subdued in the low 12s. 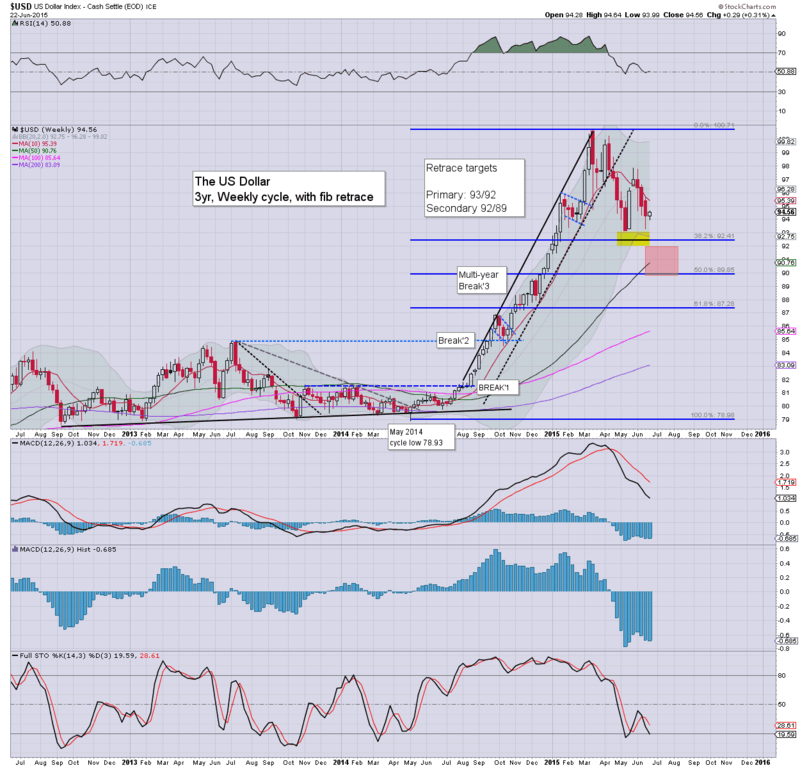 USD is holding sig' gains of 1.2% in the DXY 95.40s. Metals remain broadly weak, Gold -$8, with Silver -2.6%. 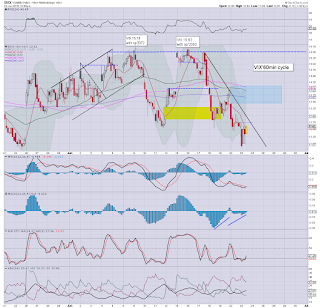 The smaller 15/60min equity cycles are offering a baby bull flag, with further minor upside early tomorrow, to the sp'2130/35 zone. I'm still seeking some degree of weakness into end month. The 2060s remain 'best case'. A great escape... for Capt' Priceline, backed by the powerful score of Horner. US equities remain in minor chop mode around sp'2120.. with VIX -2% in the mid 12s. 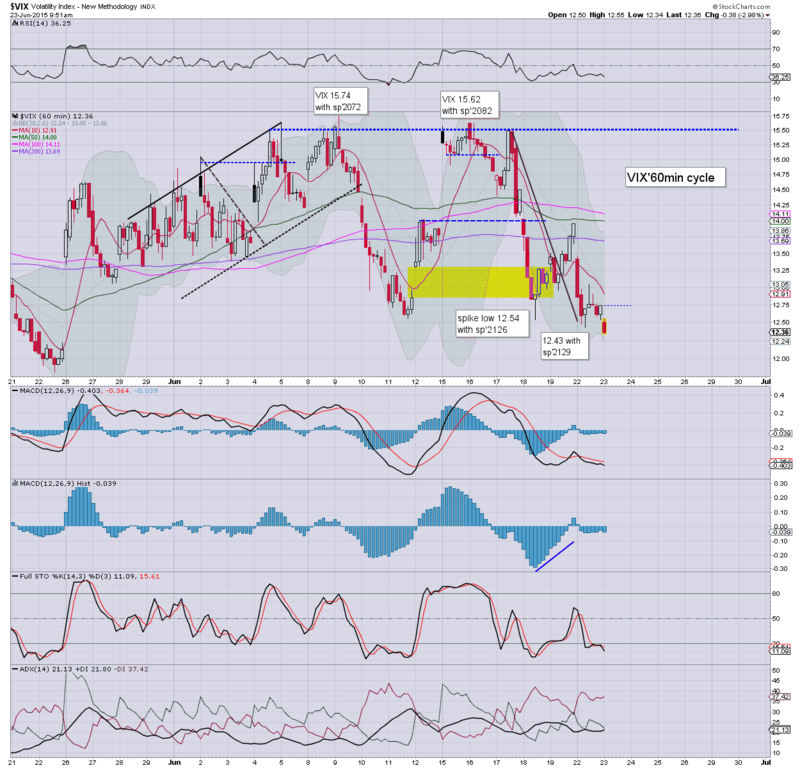 USD is holding sig' gains of 1.2% in the DXY 95.40s. Metals remain under pressure, Gold -$8, with Silver -2.7%. Oil is holding strong gains of 1.8%. A quiet Tuesday... what else could be said? US equities remain a touch weak, and it remains the case that equity bears should be battling for a daily close <sp'2115, with VIX 13s. USD is re-building sig' gains of 1.2% in the DXY 95.40s. Metals remain under pressure, Gold -$7, with Silver -2.4%. Oil has built very strong gains of 1.9%.. back above the $60 threshold. Little to add... on what remains a quiet day. 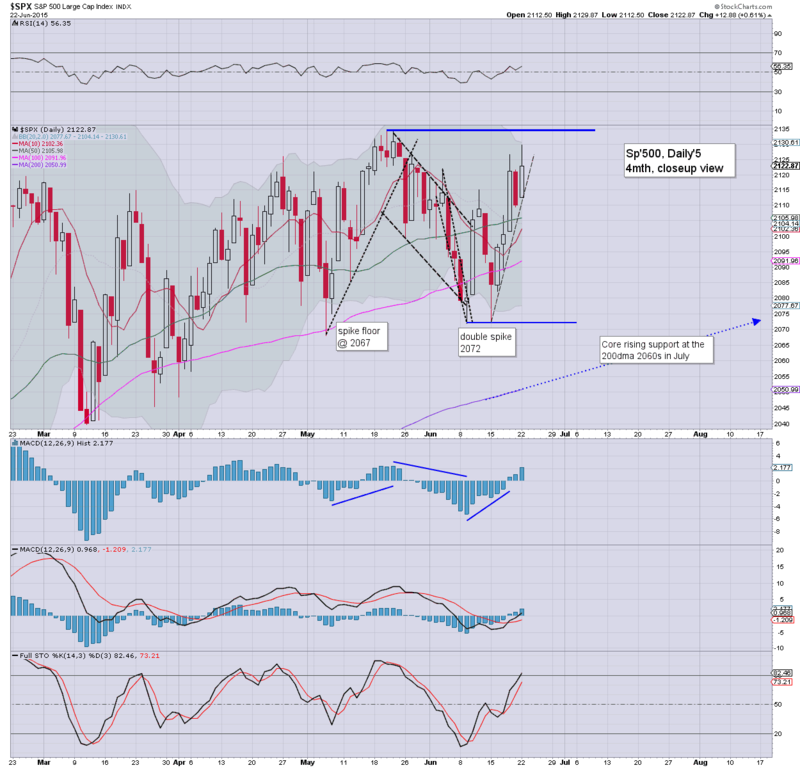 All things considered, some further weakness into the close looks probable. *GDP data (second rev') tomorrow.. market is seeking -0.2%... not exactly inspiring. Clearly, anything above consensus, and concerns about higher rates will return... favouring the equity bears. 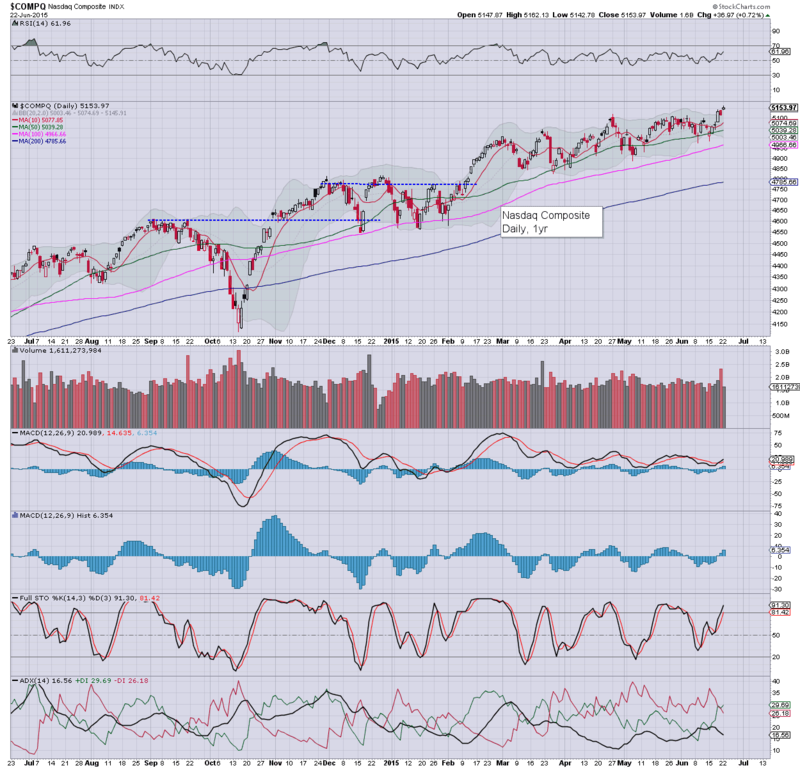 *fractional new historic highs in the R2K and Nasdaq comp'. A pretty subdued day overall. Clearly, market is awaiting more Greek news. notable weakness: coal miners, ANR -5%... the sector of relentless horror. US equities have cooled a little, but there will be no short term bearish clarity unless a close <sp'2115.. along with VIX 14s. 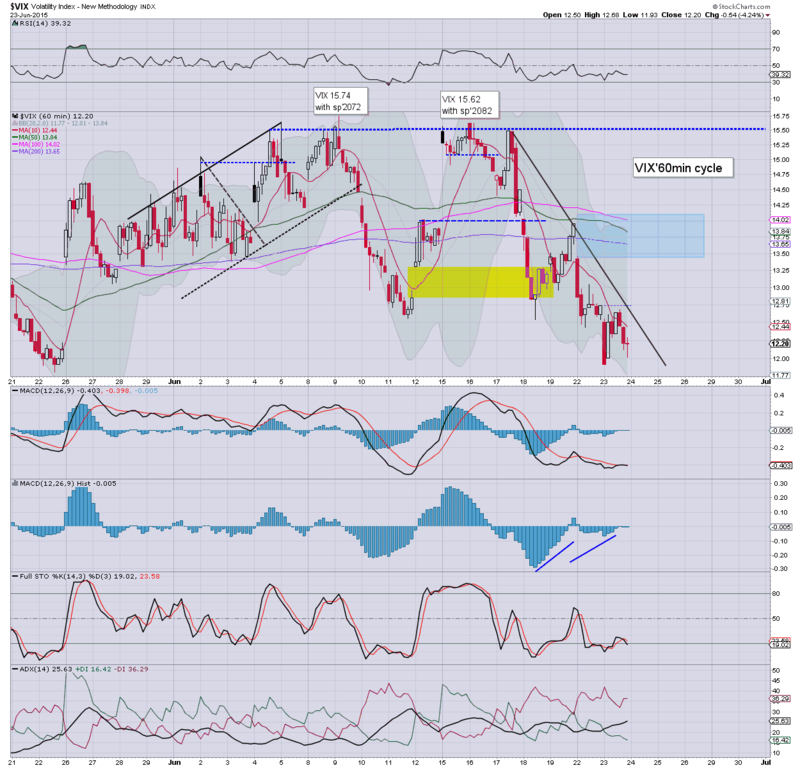 USD is holding sig' gains of 1.0% in the DXY 95.20s. Metals are naturally lower, Gold -$6, with Silver -2.1%. RE: USD/UUP. 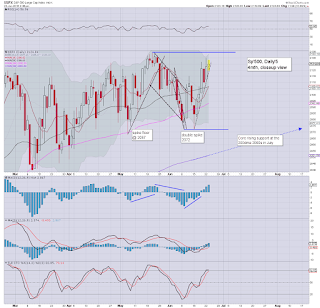 Very difficult to say if the retrace from mid March is now complete. The current black-fail candle on the daily chart is offering threat of renewed downside.... as ever.. the daily close is what matters. 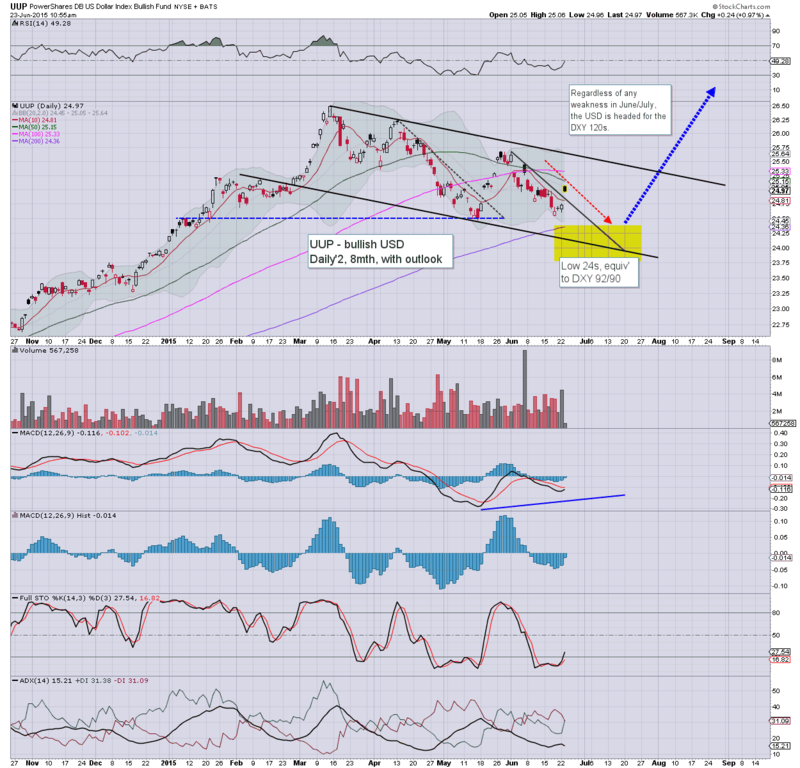 *I am seeking a major long UUP position from this summer into next year... for now... still waiting. Fractional equity weakness, at best... increasingly moderate weakness into the close.... it won't be easy to break <2115.. no doubt the algo-bots are well aware of that rising trend/support. 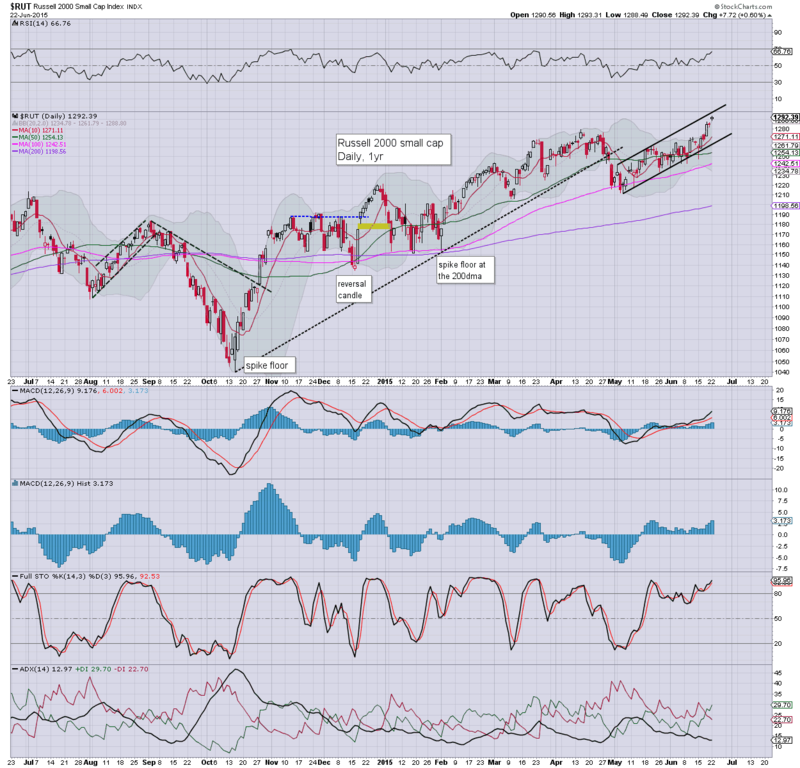 US equities open a little higher, but look a little vulnerable. 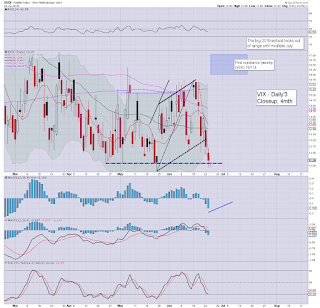 Equity bears just need a daily close <sp'2115 to break the bearish wedge.... along with VIX 14s to offer added clarity. 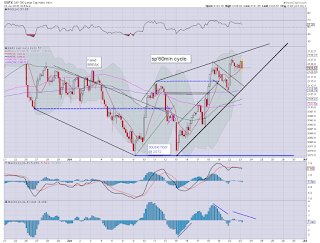 The Greek situation is far from resolved, and there remains high risk of weakness into end month. 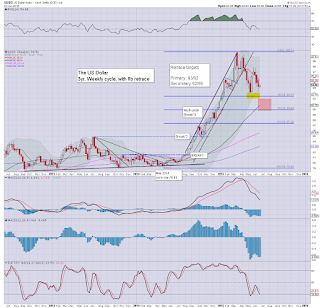 A lot of things are going on... not least in the USD, +1.3% in the DXY 95s. I'm unsure if we're now seeing a major new wave higher. In any case, metals/oil will be under pressure on any sustained dollar strength. So.. lets see if we can get a daily close <2115. Even then.. bears can't get moderately excited unless back under the 2100 threshold. 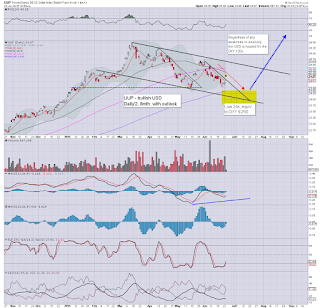 *I remain short INTC, I'd sure like a daily close under the $32 threshold. re: 16309 - composer James Horner died in a plane crash yesterday. One of my top 3 film scorers, I would imagine many people wouldn't identify with the name, but they'd sure recognise many of the themes. Other themes... across the day I think. stay tuned.. and stay out of small planes and helicopters. 10.11am.. VIX knocked to 11.93..... truly... bizarre. Some 'games' being played by 'them' again? 10.21am.. INTC -1.0%... in the $31.90s.... pretty good so far today..... first soft target is 30.50... lower daily bol'.. that will likely take 2-3 days though. Good morning. Futures are a little higher, sp +4pts, we're set to open at 2126... a mere 8pts shy of a new historic high. 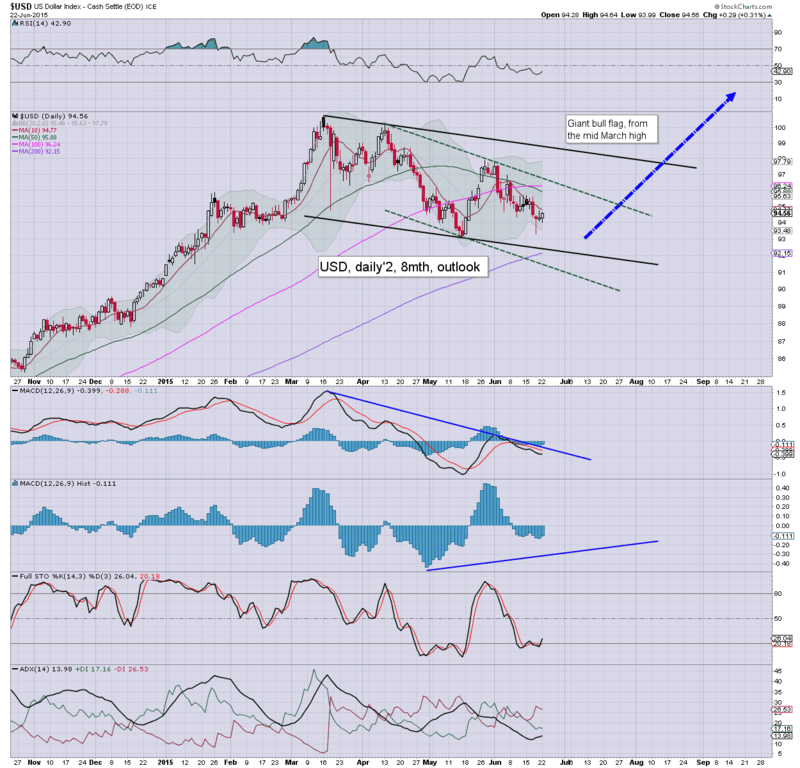 USD is on the rise, +0.9% in the DXY 95.20s. Metals are naturally weak, Gold -$4. Oil is similarly under $ pressure, -0.3%.. battling to hold the $60 threshold. So... we're set for early gains.. as the market continues to believe 'all is well' in SE Europe. Yeah.. sure it is. No bank runs... and absolutely no chance the Greeks would default. They are good for their debts... like the Lannisters, right? Equity bears should be seeking a break of the wedge... by the close of today.. that will only need a move <sp'2115.. .a mere 7pts lower. Overnight action: China saw another crazy volatile session, swinging from a low of 4264, but settling +2.2% @ 4576. 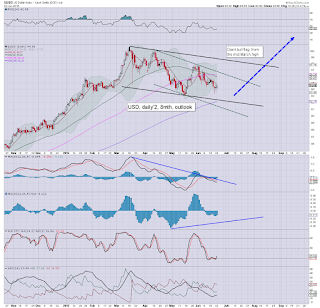 Broadly, the Shanghai comp' still looks on track for the 3400s... that would be a very natural retrace of the hyper ramp from May 2014. 8.31am. Durable goods orders, -1.8%... not so pretty. Ex-trains, +0.5%.. inline.... still.. not particularly great. Market levels remain as earlier. Whilst the US and most other world equity markets saw a positive start to the week, the USD settled moderately higher, +0.3% @ DXY 94.56. The 92/90 zone remains on track to be hit.. before a hyper ramp to the 120s. Considering the mid term trend since the March high of DXY 100.71, the 92/90 zone still looks very much on track within the next few weeks. Tuesday will see Durable goods orders, FHFA house price index, PMI manu', new home sales, Richmond Fed'. No doubt though, the market will be more focused on Greece.. with sporadic headlines probable across the day. 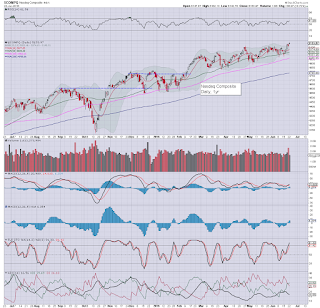 *most notable aspect of the day, new historic highs in the R2K (1293) and the Nasdaq comp' (5162). Suffice to add... a day for the equity bulls... there is no sign of the current rally ending, although price structure on some indexes is a rather clear bearish wedge... offering a sig' break lower no later than Wed/Thursday. 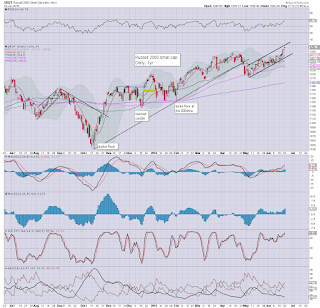 At best, the equity bears look able to hit the sp'2060s by early July.. where the 200dma will be lurking.